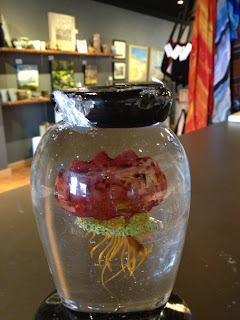 A few weeks ago, I ran down to Benton Harbor’s Water Street Glassworks to pick up a custom piece by Eli and Margie. It was a beautiful glass vase. Our customer was very excited to bring it home. Sadly, it broke on the way home. The good news is our artisans immediately said, “Don’t worry, Cyndi, we will fix it. What broke?” The two parts of the vase broke apart. Sadly, the bottom dropped out of our wrappings on its way back into the gallery. The good news….Margie and Eli made a new base, reattached it. The vase has arrived to the client’s home and is now properly displayed and being enjoyed. One of the things that I most appreciate about our C2C artists is that they are all professionals. The goal is to have happy customers, enjoying their artwork. Every piece of artwork in this gallery was created by a professional artist. They have spent thousands of hours practicing their craft to arrive at a high level of expertise.